Orlando yoyo player Alec Jones scored himself a nice profile piece on OrlandoMagazine.com! It’s a nice bit of public outreach for modern yoyoing…congrats Alec, and nice job! Check out the full article here: Alec Jones on OrlandoMagazine.com. John Ando is one of the most influential players of the modern yoyo era and if you don’t know why, this video should clear it up. His unique trick construction showcases the very best of the modern era…truly unique moves and transitions that catch your eye immediately and on closer inspection are simple enough that you can’t imagine why you didn’t think of them yourself. His form and technique are flawless, and it’s no wonder that top level players all over the world cite Ando as a major influence on their play. 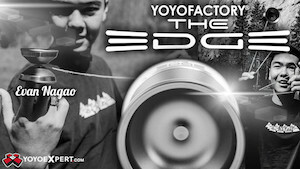 Yoyo used is the YoYoFactory Genesis. Awesome as it is, it seems that 3D printing hasn’t quite changed civilization as we were promised. It is, however, quickly becoming the prototyping tool of choice in numerous industries, and that includes yo-yos. Quite a few people with access to a 3D printer have designed and made a yo-yo at this point, with varying degrees of success. That includes a set of 100% printed fixed axle yo-yos from Microsoft, part of the tech giant’s initiative to add 3D printer support to the Windows operating system. But simply printing regular yo-yo designs is not where the power of 3D printing lies, it is a very time-consuming method of making yo-yos. The true power of this technology is breaking the boundaries of conventional industrial design. One of the earliest approaches to custom printed parts for yo-yos came from Werrd Alliance’s Yu Tsumura, which can be found in his YoYoTopology account on Shapeways. A 3D printer may not be as good as a lathe when it comes to producing perfectly circular objects, exciting new designs are possible thanks to the ease of printing complex details. The “Future”, which was covered here on YoYoNews before, is a great example. Printed in stainless steel, the design by Adam Blanchard features an amazing honeycomb design, which not only improves weight distribution, but is also impossible to replicate on a lathe! The honeycomb pattern can also be seen on the creations of one of the most prolific printed yo-yo designers on the scene, Mr. Hideki Toho, a.k.a “East”, under his Yo-yo Maker initiative. We’ve featured Mr. Toho’s designs several times, including his beautiful hybrid nylon-steel “Three Dimension Type 1”, a set of Yin Yang loopers, and the impossibly cool Lego caps for the Freehand Zero. Be sure to follow his blog (in Japanese), for more awesome designs, and insights. And even if you are not CAD-savvy, Kyle Weems has got you covered. Check out his mind-blowing system at kyostoys.com: you can design your own yo-yo from any combination of shape parts, response types, and bearing sizes, and order a print, all inside your browser! This truly feels like the future! You can even design a completely unique shape if you want, by following the template available on the website! How can I design a product that can not be manufactured by any other means (Machining, Injection molding, etc) except 3d printing? That’s exactly the mindset that pushes the limits of design and brings fresh ideas to the industry! Check out two of his designs, the Kayto 2 and Glocadius. These can’t be manufactured by any other means! The Kayto 2. Note the hollow section near the hub! The Glocadius. The parts are disconnected! Or are they? Another strength in 3D printing technology is that it allows quick prototyping and testing of new ideas. We’ve recently seen it employed on a couple of Kickstarter yo-yo projects: the wildly successful Ti-Yo, and the interesting YOYODrone. And this super cool “Emergency Yo-yo“, featuring 3D printed halves, a paper axle, and coins for weight distribution! Will 3D printing ever become the technology of choice for yo-yo manufacture? 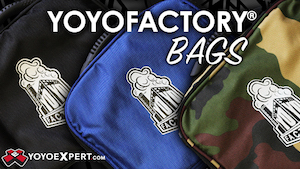 Probably not, but we are excited about the possibilities it opens for yo-yo design! 44FESTA 1st Anniversary! Yo-yos, ducks, and cake! It’s no secret that I’m a big fan of 44FESTA, probably the best regular event for ALL attendees, from World Champions to moms and dads. And I’m quite happy to wish the FESTA crew – Masanobu, Hassy, Jun, Bryan, and Kenji – a very happy 1st anniversary! As you know, 44FESTA has a year-long score kept for all attendees, and the anniversary event is where plenty of cute trophies and ducks are awarded. Freestyle award, mini-contest award, kid award, mom & dad award, and many more were awarded a the anniversary edition on August 3rd. There was even a photo book for sale! I love yo-yo photo books! Especially those with Pon in them! Also new for this event was the lack of a freestyle contest. Instead, a random-draw trick battle took place, and old-schooler Ryusei Saito beat the young Yamato Fujiwara in the final battle to take the duck home. The 44FESTA crew sends many thanks for the companies and individuals who have been supporting the event since its first edition one year ago, and invites us all to the next events, on September 14th and October 12th! It’s time for another report from 44FESTA all the way from Japan! 44FESTA has been going on for almost one year, and this edition’s special treat was a 44CLASH exhibit, with all sorts of memorabilia and goods from the world’s best indie yo-yo contest, which is back this year after a one year hiatus! The freestyle contest was quite solid, as usual, with Hajime Miura in great shape showing what we can expect from him in Prague next month! All freestyle videos can be found on the 44FESTA website! The next edition marks the first anniversary of 44FESTA, and will be held on August 3rd. In addition to the usual events, a Trick Battle and the 44FESTA Award will be the special attractions. Don’t miss it! Russian player Stepan Strelov just dropped a new video with the St. Petersburg YoYo School, and there’s some solid play in here. If you haven’t tried the Lava yet, it’s a really good throw at a budget price! Yoyofficer’s latest releases, the Musket and the Lava, get some love from their team in this new promo video. The yoyos themselves are pretty excellent budget metal throws, retailing for $45 – $50 each, and the video has some nice play. Double Beesting is a harder variation of regular beesting, and is the first beesting variation to learn before getting into other types of beestings. You’ll need to know this trick if you want to learn how to do repeating beesting, which I will be covering later in the month. You’ll need to know regular beesting before learning this trick. Here is a link to Miguel Correa’s tutorial. Infinity is a version of repeated 360 that allows you to do the trick endlessly. It’s simple and easily mastered, but looks like magic to non yoyoers.